A soil may be solid, semi-solid, plastic or liquid, depending on how much water it contains. Geologists often refer to the limits of water in each of these states, a basic measure of fine-grained soils, as the Atterberg limits. The term comes from the man who originally formulated the limits, Swedish chemist Albert Atterberg. Geologists traditionally measure soil plasticity by cutting a groove in soil placed in a plastic cup and dropping the cup repeatedly onto a plastic base to see how many blows it takes for the groove to close. Lay persons can get a rough measure of soil plasticity by the ball test, the worm test and the dilatancy test. A ball formed from clay-like soils, which have high plasticity, can be tossed repeatedly from hand to hand without breaking. Low-plasticity soils such as silt, fall apart when tossed back and forth. Non-plasticity soils, such as sand, cannot be formed into balls. Using the palms of both hands to roll a narrow worm of soil is another crude measurement of soil plasticity. More plastic soils can form longer worms. A sandy soil, which has no plasticity at all, cannot be rolled into a worm. Silt or low-plasticity soils can yield a worm 3/4 to 1 1/4 inch long. A plastic clay soil can be rolled into a worm 6 inches long. Worms made from weakly plastic soils are fragile. Longer worms formed from plastic clay soils are tough. A worm from a clay soil can be compressed and made into a new worm many times. What is called the dilatancy test (jarring or shaking) is a test of silt-like quality of a soil. As silty soils are compacted or decreased in volume, the excess water is pushed to the surface. A pat of moist soil in one hand is struck by the other. If it looks glossy or shiny, it is a silty soil with low plasticity. If it is a clay soil, with high plasticity, it will not look glossy. Beach sand has a low plasticity. Stepping on wet beach sand will produce a flush of water to the surface after the foot is lifted. Adding water to clay can turn it from a solid into a fluid state. Heavy rains that saturate clay on a steep slope can suddenly turn into a liquid, resulting in a landslide. A low plasticity soil like sand is subject to erosion by prolonged rains. 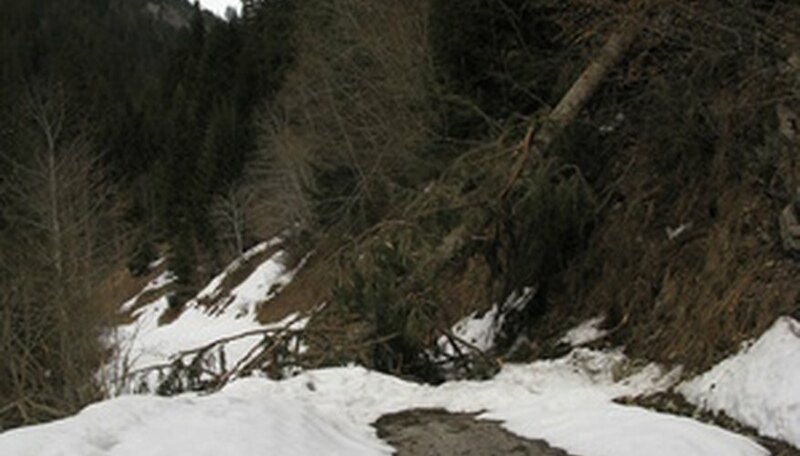 Steep slopes of clay in areas of heavy rainfall may be have to be held in place by ground cover to prevent landslides. B.C. Watershed Restoration Technical Bulletin: What is Soil Plasticity?